All Bridge played today is Contract Bridge. There are a few key variations. We clarify the major distinctions briefly below. Competitive Bridge, including Bridge played in most Bridge clubs and international matches, is Duplicate Bridge. 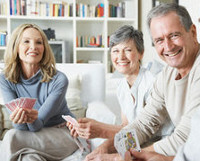 The key feature of Duplicate Bridge is that each deal is preserved after play and played again at another table by different players. The element of chance is therefore low: the result does not depend on the cards you’re dealt as you’re comparing your performance to another Bridge player holding exactly the same cards as you. 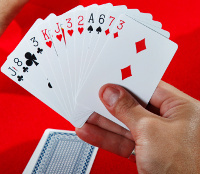 In Duplicate Bridge, the score for each deal does not depend on what happened on any previous deal. 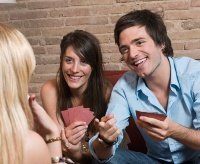 Duplicate Bridge is principally played either as a pair or a team. Matches between clubs, counties, and countries are as teams. Each team has at least two pairs, sometimes with further pairs as substitutes to provide a ‘squad’ to be rotated during or between matches. A team of three pairs is standard, for example, in international matches. Most social Bridge played at home or with friends is Rubber Bridge. A Rubber is like a set at tennis but with two games required to win the Rubber. Unlike Duplicate Bridge, in Rubber Bridge the score from the deal may be carried over to the next and the same deal is not played again at another table. Rubber Bridge is sometimes played for money. The best known Rubber Bridge club in London is TGRs. In the short-run, luck plays a much larger part in Rubber Bridge (although skill is still important). Chicago Bridge is reputed to have been developed by commuters in the city of Chicago who only had limited time in each direction to play Bridge. Each ‘Chicago’ is a set of exactly four deals – with experience this take about half an hour to play (Rubber Bridge is of variable length of play). Chicago is a blend of Duplicate Bridge (the scoring is similar) and Rubber Bridge (the same deal is not played again at another table). 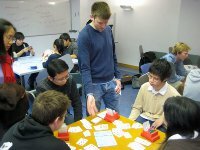 MiniBridge is a simplified form of Bridge used as a stepping stone to learn to play Bridge. It was popularised in the Netherlands. It is promoted by the English Bridge Union (EBU) and taught in schools in England. Acol Bridge is an approach to Bridge rather than a variant in the rules or scoring of the card game. Acol is therefore played in Duplicate, Rubber, and Chicago Bridge. 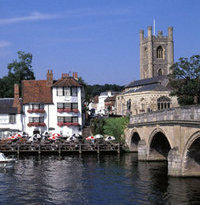 It is the most popular approach to Bridge in England. Acol was developed in the 1930s and 1940s and is named after the Acol Bridge Club, previously located on the Acol Road in north London. 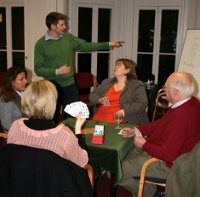 The Acol Bridge Club is still an active Bridge club today. At The Henley Bridge School, we teach Acol Bridge and play sessions of Duplicate Bridge, Rubber Bridge (but not for money! ), and Chicago depending on your style and preference as you learn to play.